Somehow, last week's update was published before it should have been, and then things were crazy and I didn't get to it, so combined with the flu hitting our house and getting back into the swing of things this month, #dinner365 fell off the rails a bit. Well-on here it did, if you follow me on twitter you would've seen my updates. Let's just round it all back up and do a little catch up, shall we? I have lots of great stuff to share with you. What graced our table since the last update? Day 10: Leftovers. The flu was hanging on and I still felt pretty terrible. Day 11: I was still not feeling well, but these leftover baked egg rolls did the trick. I love having things in the freezer to just pull out, heat, and eat. With a salad and some leftover rice, they were really tasty. I originally made them for Christmas Eve, but we still had a bunch and they made a great light dinner. Day 12: With a bunch of leftover sausages, veggies, a can of tomato sauce and a bit of red wine I had tossed in the freezer, I put together a spaghetti sauce. It was actually the first meal in a week I felt like eating! Ladled over noodles and topped with cheese, it was a comforting and tasty dinner. The leftovers went back into the freezer for another day. Day 13: I don't know about your Mondays, but mine are always busy. This Monday meant a painter was coming to the house, so I had to be home right after work. With such a busy week ahead, I wanted something easy and fast. Recently I had watched Save with Jamie on Food Network and had seen him make mushrooms on toast. They seem ridiculously easy and almost not even a dinner thing, but I paired them up with a leek and potato soup (recipe here). The mushrooms on toast were amazing. Buttery, meaty, and herby, we all ate and licked our fingers. I didn't make them exactly like the recipe, but even so, they were very tasty. The soup was great and made wonderful leftovers. It's not often I make dessert, but we had cappuccino pudding, topped with whipped cream. It was a great way to start the week. Cappuccino pudding recipe (on BC Eggs) here. Day 14: A great way to use up bits of food in the fridge and stretch a little meat is to make a stir fry. I rummaged through my fridge and tossed together peppers, broccoli, some canned mini corn cobs, and peas. With this sauce and served over saffron rice, it was really good. When you're never really sure when people will be home for dinner, a stir fry is great because you can prep everything and then throw it together when they arrive. Sweet and Sour Chicken Stirfry recipe here. Day 15: Wednesday was a busy day, with me not even coming home for dinner. By the time I got home it was late, but there were veggie burritos in the freezer just waiting to be put in the oven. We even found a stray avocado in the fridge, which was mashed up and slathered on top. Homemade burritos are a staple in our house, and often pulled out of the freezer just for nights like this. Day 16: I could have cooked, but the reality is I didn't really feel like it. Nothing else in the house seemed appealing so I was back in the freezer, this time pulling out pre-made burger patties and frying them up. Topped with Swiss cheese, lettuce and tomato and then paired with roasted sweet potatoes and salad, it was a tasty dinner. For my non-beef eater, I cut a chicken breast in half, pounded it to about 1/4 inch thickness, then sauteed it up. Everyone was happy! Day 17: Do you ever plan something, then change your mind once you get started? I often do that. My plan was to make honey mustard drumsticks, but instead I went the BBQ route and made these ones instead (recipe here). Sticky, sweet, a bit spicy, they are a huge favorite in our house. We snarfed them down with mashed potatoes, a green salad, Cobs dinner buns, and some steamed peas. The potatoes were kind of terrible. Mealy and grey, they really just weren't that good. I'm not sure what to do with the rest of the bag-there's not a lot left, but oy are they awful. Soup, maybe? I hate to throw food away, but these are almost inedible. Day 18: Kevin's girlfriend came to visit, so I let the kids decide what they wanted for dinner. The choice was chicken mole or tacos. They chose tacos! I love setting up a serve yourself taco bar. It's totally low maintenance and everyone gets what they want. The one thing I can never leave out is guacamole, which Kevin literally will eat by the spoonful. We had a ground beef mixture, but I also sauteed up sliced chicken breast for John. Day 19: With lots of leftovers in the fridge, we had quite a bit to choose from. The kids went out for sushi so it was just John and I, and since I needed to cook something for BC Eggs, I put together some Portuguese Eggs. I also got really, really ambitious and made homemade cinnamon buns. The eggs were amazing; easily the best baked eggs I've had in awhile. Baked Portuguese Eggs recipe (on BC Eggs) here. Day 20: It's Monday and I don't want to cook, so it's a leftover smorgasboard! Everything came out of the fridge, was placed on the counter, and was a "serve and heat it up yourself" kind of dinner. Everyone was pretty happy. 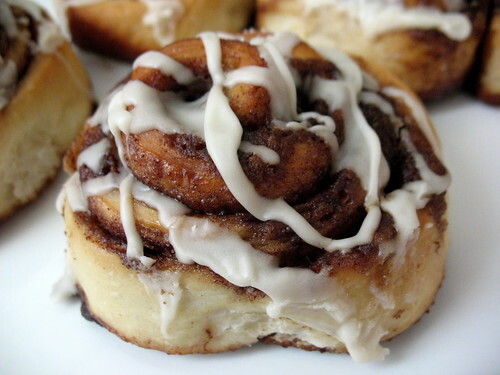 We were still stuffing ourselves with cinnamon buns, sugar rush be damned. Day 21: I've made pasta carbonara before, and I quite like it-except on this day, everyone was running late and I ended up making dinner at around 6 pm, which killed my idea of taking a photo of this so that I could write up the recipe for BC eggs. Bacon, eggs, cheese and pasta; what more could you ask for? No recipe this time, but I'll make it again just for you. Day 22: With leftover leeks, cream, and a pie crust in the fridge, a quiche seemed like a great idea. This one is hands down the best I've ever eaten. Gordon Ramsay says you should have 2/3 flavoring ingredients to 1/3 custard, and damn that man is a genius. The recipe is coming on BC Eggs on Monday. Watch for it. It's so good I literally devoured the subject of this photo the minute I had a good shot. I've been really loving my Save with Jamie cookbook (so much I wrote a review on BC Eggs!). I admit, I wasn't quite sure if I was on board with the yams in baked beans, but I have to tell you-it was amazing. My family LOVED it, even my notorious picky eater. The cornbread from the day before was delicious to dip in the sauce and soon, we were all completely stuffed. The recipe (with a few adaptations) will be up on Chasing Tomatoes next week. We still have lots of leftovers, so we'll be noshing on the rest for Day 25! Now that we're all caught up, next week will be interesting. I have a late dentist appointment in the beginning of the week, a training course part way through, and Kevin will be away for most of it so it will be empty nester cooking. John doesn't eat much, either. This may be a bit of a challenge, but I'm up for it.